Boeing said last summer it is on schedule to deliver the first 406-seat 777X in 2020. 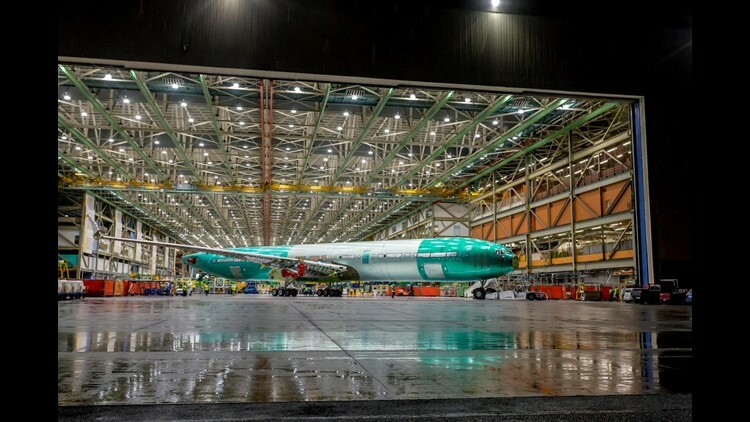 Boeing has built and rolled out its first 777X widebody from its factory in Everett, Washington, last week, but it will never actually fly. Instead, the first of the Chicago-based jet maker's largest and most advanced airplane ever built will undergo 12 months of "static" testing and verification of load-bearing parts in its airframe and wings. The first test aircraft, featuring wings made by its new automated composite wing center, will be followed by four more 777Xs being produced for full Boeing flight testing. Click here to take a look inside the center where the aircraft’s wings were made. The sixth jet produced by the line will be used for structures fatigue testing, Boeing Vice President of Global Brand Marketing Jerry Verghes said on his LinkedIn page. "It's an exciting time for us and for the passengers of our customers — All Nippon Airways, Cathay Pacific, Emirates, Etihad, Lufthansa, Qatar Airways and Singapore — as the world's longest (252 feet) and widest (235 feet) commercial jet airplane comes to life," Verghes wrote. The 777X was introduced at the Dubai Airshow in 2013. It has since garnered 326 orders. Cowen aerospace analyst Cai von Rumohr said in a recent report that Boeing's 777X spending will increase this year and next as it prepares for flight tests and delivery of the aircraft to the first customers. "777X/777 cash drain will increase in 2019 but should be comfortably outweighed by potential plus swings elsewhere," von Rumohr said, adding that higher revenues should be generated by increased 737 and 787 passenger jet production, in addition to higher 767 Freighter production. Take a look at a flight test of the engine that will power the craft. Boeing says the 777X aircraft's windows will be 30 percent larger than those on rival Airbus A350 jets and sit higher on the fuselage. The 777X will also be the first commercial airplane with touchscreen technology in the cockpit. Folding wingtips will allow it to use widebody gates at major airports, despite its larger size. Boeing gave its most devoted aviation enthusiasts a tour of the new 777X aircraft in a video available online. Click here for more information on the new Boeing aircraft. And check out more of Boeing’s jumbo jets and planes.